Everything worth having in life is worth receiving regular loving care. This goes for marriages, relationships, your home, your car and also for your jewelry. I learned the hard and stressful way when I procrastinated on my engagement ring maintenance. As I stepped out of the shower one day in June, I looked down at my engagement ring as I often do every day. This time the view was shocking instead of full of lovely memories of my wedding day. I saw empty prongs with a missing center diamond! The next few minutes were spent saying “No, No, No” and a frantic search around the tub, the drain and floor of the bathroom. No diamond in sight. My heart was sinking and my stomach was tightening. I had lost my diamond from my ring. Needless to say, not much got done for work this day. After searching all the floors of my home and the dismantling of the shower drain with no results, I made the dreaded phone call to my husband. With tears streaming down my face, my husband, being the calm loving man he is, assured me that we would get it fixed, repaired, whatever it takes. 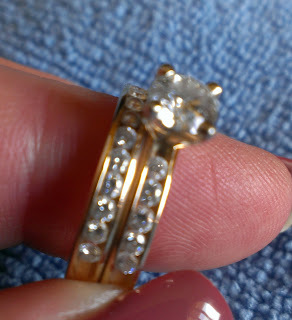 He called our jeweler and made an appointment for the following Monday to have the broken prongs looked at. Two of the four prongs had broken off at the top. The rest of my day was spent scouring the house, the furniture, our bed, sinks, everywhere for the missing stone. I knew it was somewhere in the house because I looked at it the previous night before going to bed. Later when my husband got home from work he went under the house and cleaned out the P Trap in hopes the stone would be found there. Ladies you do not want to have to do this. It is beyond icky! Still no diamond found! The only good thing about this ugly activity was I knew then and there that my husband would do anything for me. That night I went through the house one more time with a bright flashlight and all the lights in the house off….searching the floors and rugs. As I went through the half bath down the hall with my flashlight, I was feeling I would never sleep this night. Searching around the back of the toilet and toilet topper I saw a little glint. Could it be? In the cabinet over the toilet on the bottom shelf was a small round shiny object: MY DIAMOND! Yes! Yes! Yes! Happy tears and running through the house yelling “I found it! I found it!” One of my luckiest and happiest moments! I was lucky that my center stone did not dislodge outside of my house. Don’t let this potential loss happen to you. Here are some steps to preventing this very upsetting experience. 1. Twice a year inspections - My jeweler warranties the integrity of the ring if you bring it in for twice a year inspections. Add this to your reminders on your calendar so you do not forget to schedule this inspection. They will check your ring for wear and tear, for the integrity of the prongs and to check if the stone is still in the setting properly. At this same time you can usually get your ring cleaned professionally. It will sparkle like new! 2. Regular cleaning at home – Clean your ring at home monthly. It depends on the type of stone which cleaner you should use, if any. Ask your jeweler what the proper care is for your stone(s). A toothbrush is a good tool for a light gentle cleaning under the center stone and around the setting. Very mild dish soap is what I use. Rinse well. 3. Remove when doing yard work or other hand work - Ladies, most of us wear our diamonds every day not matter what we are doing. We do house cleaning, yard work, as well as many other things. We risk bumping or harming our engagement ring during some of these rigorous processes. I know that I always feel weird without my ring on but I take it off now when doing yard work, scrubbing and some types of food prep as well. Have the same safe place to put your ring every time you take it off. When I told one of my friends about my experience, she shared with me that she had lost her center stone while gardening. I hope my experience will end your procrastination to have your precious ring checked twice a year. See my ring below all fixed. Ladies, don’t let my experience happen to you. I found my stone and was very fortunate. Make the appointment to maintain your engagement ring so YOU don’t ever lose YOUR bling. Getting Married? Attend a wedding show or event. If you are engaged and looking for quality vendors for your wedding day, consider attending a wedding show or event. The Puget Sound area has some excellent wedding events to attend and check out local wedding professionals. As a professional wedding consultant , I will be at Seattle Wedding Show coming next year on January 11th and 12th, 2014. Come by and meet me and other vendors. · Go to the show online and pick out your top 5 vendors that you want to see and consider for your wedding. Write down the booth numbers and company names. Shows can be overwhelming when there can be 200 vendors or more at a show. This way you have a plan of who is most important for you to see. · Many wedding events have vendor drawings and you may also want specific vendors to contact you after the day of the show. Consider pre-printing some labels with your crucial contact information. I cannot tell you how disappointing it is as a vendor to have a drawing and not be able to decipher the handwriting of the winner. Your labels should have the info you want to share: Name (Bride/Groom), phone, email, wedding date, and your mailing address (if you wish). Any office supply store will have labels you can print at home and then peel off and place on entry forms or contact forms at the show. Quick and easy for you and easy to read for the vendor. · You may find the perfect vendor for you at the wedding show. Go to the show with your checkbook and credit card so you can book a vendor that day if you wish. A few words of advice: Do not feel pressured to sign right then and there. Read the entire contract before signing or making a “deposit” to hold a vendor for your day. Most vendors take a “first payment” which is frequently non-refundable. I suggest making an appointment with a desired vendor for the week following the show. This will allow you to meet and ask questions in a less hectic environment than the show floor. · An additional way you can improve your wedding show experience is by considering your comfort. Wear comfortable shoes – you may be walking the aisles for 2 or more hours. Choose clothing that can be worn in layers. When the show floor gets crowded it can get quite warm and at the beginning of the show it can be chilly. Bring a handbag that is not heavy with items already before the show even starts. Your back and neck will thank you after the show. · Do bring information you already have for your wedding day. A small binder is a great way to have all your info gathered in one place. You can add the vendors that you meet and like at the show to your binder for easy locating later. You will be thankful later that you did this when you don’t have to sort through everything you picked up at the show. Wedding shows and events are fun and sometimes overwhelming. If you start off prepared, you will enjoy it so much more.